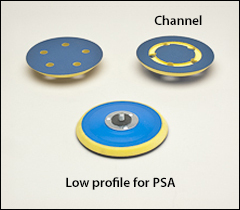 PSA backing pads, thicker foam vinyl face backing pads. 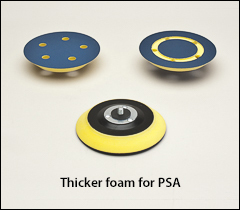 Low profile, ½" thick foam pads Use on dual action/random orbital sanders. Fine finish on flat surfaces and moderate conformity to contours and curves. Maximum RPM: 12,000 for all but the 8" diameter which is 4,800 maximum RPM. tapered edge vinyl face backing pad. More flexible for curves, contours, and fine finishing. Maximum RPM: is 10,000 for all but the 8" diameter which is 4,800 maximum RPM.